Okay! 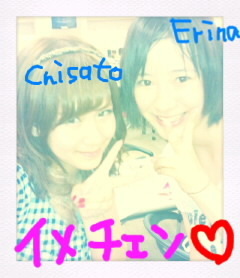 Musume Time: Short Cut - The Eripon Way! So it came to my knowledge when trolling the Hello! 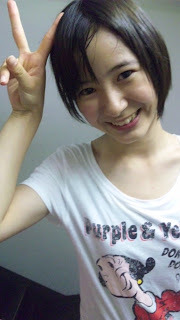 Online forums that Mistress Pon was to get a short cut! :o Few thought it was a rumour, whilst many anticipated this change with welcoming hearts, wondering just how short Mistress Pon would cut her hair! 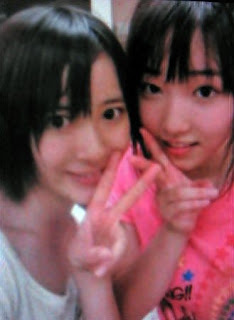 Well, without further a due, here are the pictures that surfaced on the H!O Eripon boards! 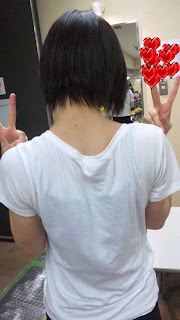 Most likely taken from Chisato's blog... or most definitely? <3 Whatever, it's a cute two-shot! From the back, we see Mistress Pon's lovely hair. I like the short cut! For some (like my sister) it may be a shock to them, and sad as well as her hair is now gone, but I really like this change that Eripon has made! I say thanks to all the H!P staff and members who suggested she get it, because without them saying 'it will look good on you' she might not have done it! I can't wait for official pictures to come out of Eripon with styled hair, because this look is great on her! It matures her a little, but it looks just beautiful!